With the chalk absolutely smashing in Week 4, DraftKings significantly tightened their pricing for the main slate. This week value looks particularly difficult to come by, after many back-ups received intentional price increases. However, with that said, here are some sneaky plays and everything else you need to know about the DraftKing's main slate. At 6.6k, Matt Ryan ranks as the third most expensive quarterback. However, through four games, only Patrick Mahomes has more fantasy points. Ryan draws a Pittsburgh defense, allowing the third-most passing yards (1,297) to date. The game also has the week's highest point total on the slate at 58. With fireworks likely, Ryan can be targeted in cash lineups. Before I say anything else, Melvin Gordon and Todd Gurley are the top two plays at running back on the slate. However, they carry enormous price tags and James Conner projects to handle similar volume at a fraction of the price. Conner leads the entire NFL, handing 93.1 percent of the Steelers running back touches. He also faces an Atlanta defense allowing the most receptions to backs. His match-up is further enhanced by the absence of run-stuffer Grady Jarrett. Lock Conner into cash and do not think twice. Noted above, the slate is tight and the top plays are expensive. With Leonard Fournette out, T.J. Yeldon offers some salary relief. After dealing with an injury earlier in the season, Yeldon broke out to handle 21 touches in Week 4. He also played on 62 percent of the Jaguars snaps, while Corey Grant handled a mere 9 percent. Yeldon offers much needed salary relief in GPPs and potentially cash. Somehow priced as the wide receiver five, Adam Thielen ranks first in targets (55) and second in receiving yards (474). Thielen has eclipsed 100 yards in each game so far and draws a solid match-up against Philadelphia. The Eagles have quietly allowed the third-most yards to receivers this season (836). Thielen makes a nice pivot in GPPs off the Falcons-Steelers game. Third-year breakout, Tyler Boyd finds himself in a friendly match-up yet again in Week 5. The Dolphins have allowed the 15th-most yards to receivers, but look particularly vulnerable to slot receivers, allowing Quincy Enunwa and Jordy Nelson to reach 92 and 173 yards respectively. Playing a majority of his snaps inside, Boyd will avoid the stout coverage of Xavien Howard. Now up to a team-leading 36 targets, Boyd remains a solid play in GPPs. 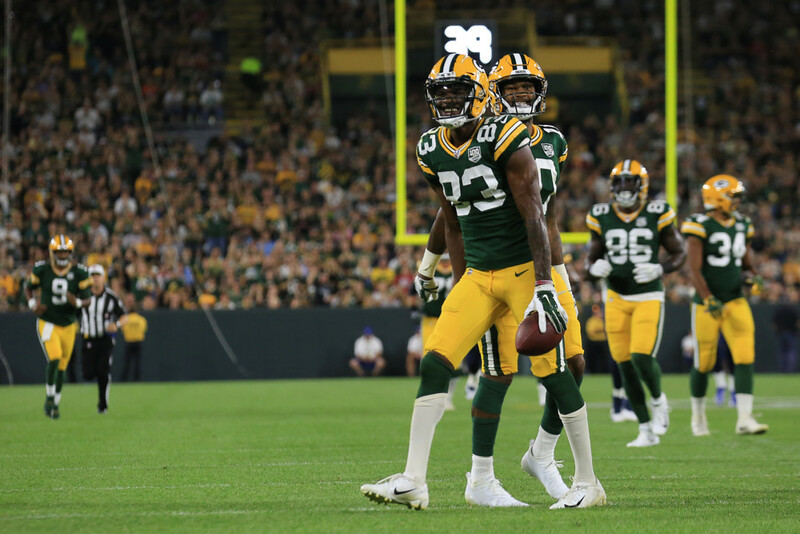 With Randall Cobb and Geronimo Allison unlikely to play, Marquez Valdes-Scantling provides arguably the most value on the slate. With Cobb out last week, Valdes-Scantling stepped in and played on 71 percent of the Packer's snaps. Darius Slay remains likely to shadow Davante Adams, which means Valdes-Scantling should benefit from softer coverage. Take the salary relief and play Valdes-Scantling in all contests. These are desperate times at tight end, but Vance McDonald has shown some promising signs of late. McDonald's snap share has grown to 62 percent while Jesse James' has dropped to 42 percent. McDonald has also out-targeted James 10-2 in their last two games. Running more routes, McDonald looks like the tight end to trust in Pittsburgh. A cheap way to obtain exposure to a likely Atlanta-Pittsburgh shootout, McDonald can be considered in cash and GPPs.